Over the past six years, Uber has become a synonym for on-demand transportation services. The San-Francisco based start-up pioneered the industry and continues to hold the pole position in the American market. According to a recent article on Bloomberg, Uber currently seeks to raise $2.1 billion in a financing round that would value the company at $62.5 billion. Uber is actively focusing on expanding its success beyond the United States. Here the company has an eye on the Asian market, notably on India and China. As such, Uber announced earlier this year that it plans to invest $1 billion each in the Chinese and Indian markets. Nevertheless, there might be a few bumps ahead. As such, earlier this month, Lyft, Uber’s main competitor in the United States, together with Didi Kuaidi, Ola and GrabTaxi, the three largest on-demand transportation services in respectively China, India and South-East Asia, announced their global partnership. By this Lyft and Didi Kuaidi expand their previously formed alliance that was announced in September 2015. According to a press release, the four companies together “cover nearly all of Southeast Asia, India, China and the United States, reaching nearly 50 percent of the world’s population”. Who are Uber, Lyft, Didi Kuaidi, Ola and GrabTaxi? With an estimated market valuation of $50 billion, Uber is the leading on-demand transportation provider in the United States. Founded in 2009, the company currently serves more than 300 cities across 68 countries. On the Chinese market, it is active in approximately 20 cities and further reports that about 30% of its rides take place in the country. In India, Uber claims to hold a 40% share and to provide 200 thousand rides a day (see here and here). Founded in 2012, Lyft is the second largest and fastest growing provider of on-demand transportation services in the United States. The company is valued at an estimated $2.6 billion and reportedly seeking to raise $500 million at a market valuation of $4 billion. According to this press release, Lyft provides 7 million rides a month across more than 190 cities. Didi Kuaidi grew out of a merger between Didi Dache and Juaidi Dache, China’s two largest on-demand transportation services, in February 2015. Didi Kuaidi invests heavily in expanding its services on the Chinese market and currently provides “7 million rides per day across 360 Chinese cities”. The merged entity holds an 83% market share in the Chinese private car-hailing market and has an estimated valuation of $15 billion. Earlier this year, the company invested $100 million in Lyft and participated in a $350 million and $500 million round of funding for respectively GrabTaxi and Ola (see this article by Johana Bhuiyan). Ola acquired its second largest competitor, TaxiForSure, in March 2015. With a self-reported 80% market share the company is leading the Indian ridesharing market and reaches an estimated valuation of $2.5 billion. According to this press release, it currently serves 102 cities and receives more than one million booking requests per day. GrabTaxi is present in six South-East Asian countries (Indonesia, Malaysia, Philippines, Singapore, Vietnam and Thailand) where it provides up to 1.5 million rides a day. The company holds a 95% percent market share in the third-party taxi hailing market and is currently valued at an estimated $1.5 billion. 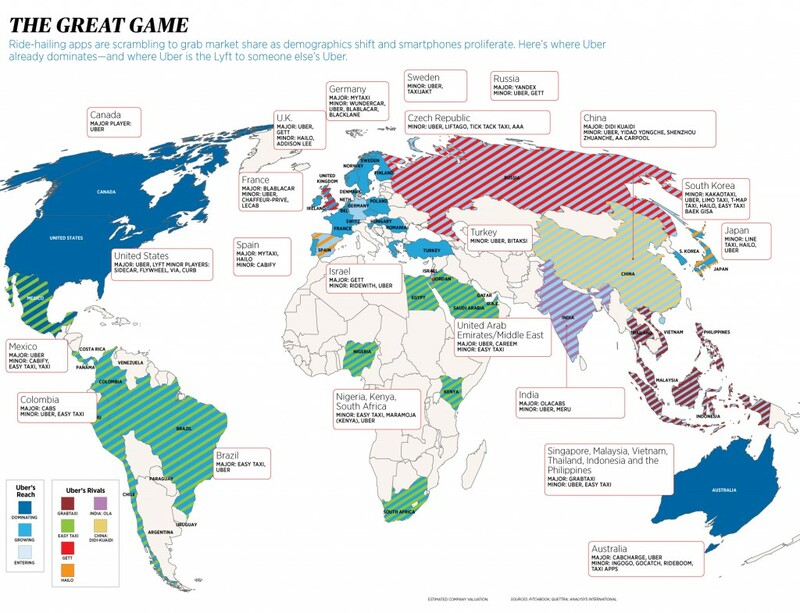 If you want to know more about the different providers of on-demand transportation services all around the world (and how they compare to Uber), have a look at the map below. What’s in it for Lyft, Didi Kuaidi and its recent partners? One of the key aspects of the partnership is a cross-app service that will become available from 2016 onward. With this service clients of Lyft, Didi Kuaidi, Ola or GrabTaxi will be able to use their local apps when traveling to countries that are covered by the partnership (i.e., the United States, China, India and the six South-East Asian countries currently covered by GrabTaxi). For international clients, this cross-app service effectively eliminates any switching costs: they can continue to use their trusted local apps, in their language and currency. Take the case of Lyft users in the United States. When traveling to China (or any other country in the network) those users no longer have to switch to a local, i.e., Chinese, provider (and set-up and familiarize themselves with a new app, that may or may not be available in their language and/or currency). Instead they can continue to use their Lyft app to haul rides. In a nutshell, the cross-app service allows consumers to multi-home, i.e., to access the services of several (international) providers, at no cost. Everything else being equal, the partnership thus increases the attractiveness of the apps offered by Lyft, Didi Kuaidi, Ola or GrabTaxi, relative to the ones by other (local) competitors that are not active in the countries covered by the partnership. As a corollary, the four companies may be able to attract new clients, especially among those that frequently travel between the countries in question. This continuity in consumer experience that follows from the cross-app service has further implications. First, companies gain access to new international consumers, without having to adapt their offer (e.g., the language or interface of the app). This allows them to save resources by leveraging on the strength of their partners in their respective markets. Second, companies do not lose track of their clients when they travel to other countries. This gives companies access to new data and ultimately additional insights into consumer preferences. The increased information allows companies to increase the quality of their services and set themselves apart from their (local) competitors. Uber and Co are two-sided platform businesses (more on this topic here on IPdigIT). As such, consumers are only one part of the equation. To grow successfully, it is equally important to attract a sufficient number of drivers for one’s service. And this is where Uber appears to be struggling. One of the main reasons seems to be that drivers do not sign exclusive contracts with transportation service providers and as such may be active on several platforms (nevertheless, at any given point in time, drivers obviously can only work for one provider). This brings with it that drivers are highly susceptible to financial incentives, such as subsidies or sign-up bonuses, and frequently switch between platforms. With a limited supply of (quality) drivers, it thus comes hardly as a surprise that continuously attracting drivers has become an expensive sport for Uber and its competitors. In that sense, the partnership is a smart move for its members. It allows them to gain a presence in international markets without having to fight incumbents. Notice that companies are taking active measures to increase driver loyalty (and the supply of drivers). For instance, Ola introduced a car leasing model and, more recently, a private loan program (similarly, Uber offers its Xchange leasing program). To be eligible for the loan program, drivers have to have been working for Ola for a minimum of six months and pay at least eight installments towards their car under the leasing model. Another related advantage of the partnership, that is emphasized by its members, is its potential for sharing ideas and best practices, “from product innovations to driver support, technology developments, winning on the regulatory front, and approaches for managing local operations in a rapidly scaling organization” (Anthony Tan, CEO and co-founder of GrabTaxi). This point is of particular importance in the given context as the markets concerned are characterized by their distinct cultural norms, preferences, infrastructure and regulatory environments. Finally, the partnership, at least in the short run, may relax competition between its members and allow them to focus on their own (local) markets, without having to fend off international competitors. Here I want to stress the “in the short run”. First, all partners show an interest in expanding their operations internationally. Second, I am wondering how sustainable the partnership is in the long run, particularly given the apparent difference between its members in terms of their current market positions and potential for (international) growth. Entering international markets: to fight or not to fight? Uber and Lyft are pursuing two very different expansion strategies. Whereas Uber is investing heavily in its own infrastructure in order to gain a foothold in international markets, Lyft is partnering up with incumbents. In a recent The New York Times article Farhad Manjoo reflects on both strategies and outlines two possible scenarios. I can see the logic in this [the global partnership], and I even think there’s a pretty good chance it could work. Lots of American tech companies have tried to conquer China and India, and almost all have failed. Uber could squander lots of money trying. And maybe, just maybe, Lyft could emerge as a strong No. 2 here. In a market valued at hundreds of billions or possibly more than a trillion dollars, that’s not a bad play. But it’s a very optimistic scenario. Here’s what could happen instead: Uber creates a near-monopoly in the United States, gets a foothold in other markets, and slowly expands that position to become dominant everywhere. So, sure, it’s risky and expensive, but if it works, there’s a big reward. And that gets to Uber’s big advantage: Operationally, so far, Uber has proved to be masterful. So while I think Lyft’s defense is smart, I would bet on Uber continuing to win. I am interested in your opinion on this matter. In your eyes, does the alliance pose a threat to Uber’s expansion strategy in the Asian market or even its position on the American market? And what about other countries such as Latin America or Europe? Could Lyft adopt a similar strategy? And if so, would it be successful?